My hands aren’t – are they small? Things become a bit clearer once you take a look at the book’s cover – “The Beautiful Poetry of Donald Trump”, with “strictly unauthorized” written underneath. It was written by Rob Sears, a Sunday Times journalist. Published in 2017, it became a best-seller. The author used a selection of quotes from Donald Trump’s various speeches, tweets, and press conferences, pasted them into “poems”, and compiled a “book of poetry”. It says so in the book, with each “verse” accompanied by a footnote detailing when and where it originated from. Donald Trump himself provides plenty of material for such a book, which could span several genres – from comedy to horror. But, let’s be realistic, he’s not the only player in the global political arena whose pearls of wisdom could boast a special edition of their own. Obviously, Rob Sears understands this very well. 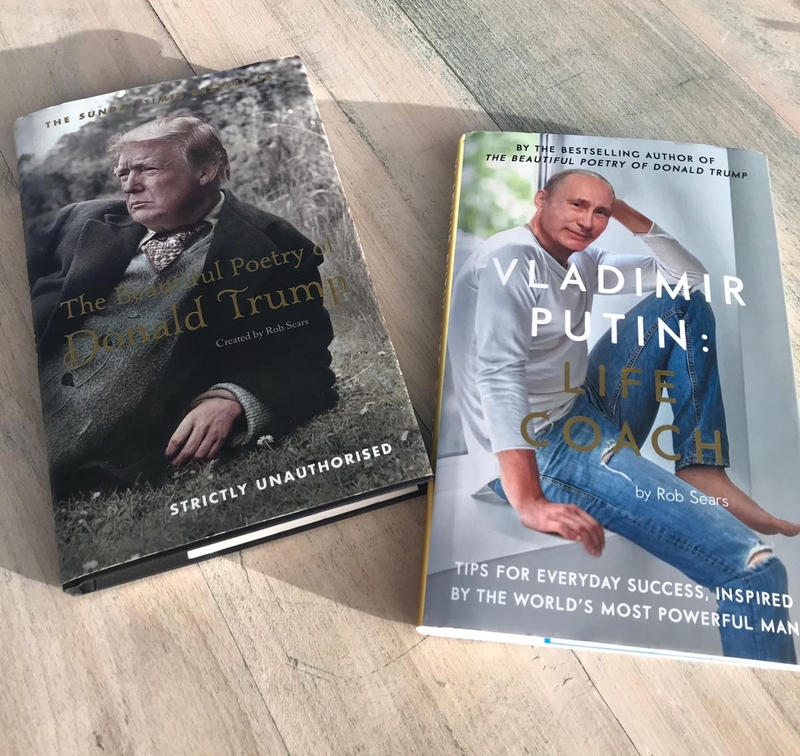 As proof of the above, after the success of his first book, he went on to publish a similarly-themed book in 2018, entitled “Vladimir Putin: Life Coach”, with the subtitle “Tips for everyday success, inspired by the world’s most powerful man”. At the very beginning of the book, readers are warned to read at their own risk, followed by a “How Putin are you” questionnaire. After completing it, you’ll see how much putinism you have inside you. At the opposite ends of the scale, you’re either zero Putin or proto-Putin. In between, you’re a balanced person with more or less traces of putinism. Talk about the contents of the book… take a look at two chapters entitled “How to Make Friends and Influence the Elections” and “Twelve Tactics of the Highly Ruthless People”. Now try not to read it! However, Trump and Putin are far from being the only people in the global political arena who inspire various literary forms. Speaking about inspiration, what about the North Korea guy – what a character for works of fiction! Naturally, past times abound with candidates as well. However, what is it that singles out Trump, Putin and the rest of them from their predecessors? The main difference is the completely different media context in which they act. The media have always been an important element of politics. As long as the number of media channels was limited, the media content broadcast via these channels was controlled. Undemocratic regimes were rife with censorship and propaganda, whereas democratic systems exhibited editorial control on the one hand, but also media pluralism and freedom of the press on the other hand. The fact that anyone with a “cellphone” in their pocket has become a medium nowadays has resulted in the disappearance of exclusive topics covered by the media. Our personal media channel hosts a plethora of topics, be they vacation pics and sunsets, politically-charged Facebook posts, Instagram stories from a concert we went to, and of course a picture of some wonderfully styled dinner at a fancy restaurant. There’s also the tweet urging the entire world to take action against climate change and an appeal to save the dolphins in Australia… something for everyone. No wonder then, that politicians have adapted to this trend and are taking advantage of new tools to communicate with their fanbase. And in line with the old phrase “The medium is the message”, they’ve adapted their way of communication to the nature of the new media. They sell themselves masquerading as one of us, and we accept them as such. The main goal of such communication is to get voters to like you, not to present a political program. Popularity is gaining advantage over credibility, and so the very content of particular politics first begins to fall by the wayside, after which it becomes almost completely lost, and the political battle dwindles down to a beauty pageant. It’s perfectly clear that this is a global phenomenon which exceeds the boundaries of political marketing. The problem is far more serious, and it affects the very nature of political systems based on representatives elected in free democratic elections. Free and independent media are the backbone of the legitimacy of such systems. Without independent media, there are no free elections, and therefore no democratic political systems. The problem, however, is not the absence of free and independent media. They exist alright, but their reach and impact are rapidly declining due to the fact that communication in general, including political communication, has mutated and now abides by different rules of the game. Growing increasingly secluded in our own media channels, we feed on content which we a priori wish to believe in, and then we interpret this conviction of ours as a general truth. But let’s get one thing straight – social networks and the new media context are not to blame for this. It’s simply our new reality. New information technology revolution has completely uprooted all of the most important areas of our lives, and thanks to it, the systems in which business, trade, transport, travel, entertainment, and so on, were set up and used to function, have changed. Only the political system has remained unchanged and has therefore become dysfunctional. We still have citizens voting every four years in systems which continue to declare themselves as democratic, circling the names of some people and political parties which will, if they get the majority of votes, go on to adopt laws and govern issues vital to citizens, in the name of the citizens. In between two election days, there is practically no participation of the citizens, which is what makes the system rigid. This gap between the rigid, dysfunctional system on the one side, and political marketing which has evolved and adapted to modern times on the other side, has opened up room for usurpation of the political system by the political class itself, and this is our reality today. This usurpation is achieved through modernized forms of populism, nationalism, and increasingly open fascism. They utilize modern means and methods of communication, and are extremely efficient at mobilizing armies of believers, perpetually pitting them against some other side – be it based on race, faith or nationality. If we take a look at our Balkan region from this perspective, we have every reason to be satisfied. Although we may be lagging behind developed countries in so many other arenas, in this one, we’re completely on-trend.